Since 2001, SNAG has sponsored lectures at the International Expositions of Sculpture Objects & Functional Art (SOFA). 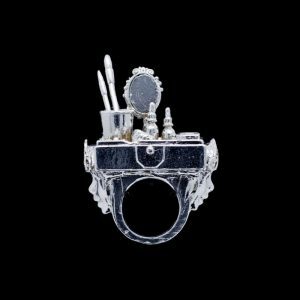 We bring some of the most interesting contemporary jewelers and metalsmiths into the public eye. All lectures are free to SOFA attendees. Don’t miss “40 Years of the École de joaillerie de Montréal” at the Musée des maîtres et artisans du Québec. On view through November 15. A retrospective exhibition featuring 60 artists and nearly 200 works of jewellery and metalwork. Four decades of original work, education, and national and international recognition. A remarkable historical portrait of Quebec craft art. Find this and more in this week’s news post. “Unique by Design: Contemporary Jewelry in the Donna Schneier Collection (Metropolitan Museum of Art)” – By Suzanne Ramljak, editor of “Metalsmith” magazine, this book features 60 pieces, created primarily from the 1960s to present day. See this and more books in this week’s news post. Elizabeth Bucheit’s tiaras were included in the “Trends” article in Lapidary Journal Jewelry Artist, August 2014. The article focuses on body adornment. 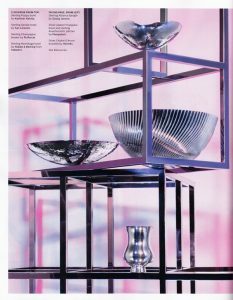 Kaminer Haislip’s silversmith work was recently featured in the magazines Elle Decor, September 2014 and Traditional Home, October 2014. Jera Lodge has begun a residency at Houston Center for Contemporary Craft. Lodge is a jewelry designer who works primarily with steel and silver. Todd Pownell was presented with the 2014 Mort Abelson New Designer of the Year Award at the JA New York Summer Show in July. Pownell’s jewelry workshop is Tap by Todd Pownell. Earlier this year, PBS visited metalsmith Rebecca Rose’s studio and captured process, gallery and interview footage for an episode of “WUCF Artisodes.” The show aired in August on over 28 national PBS affiliates.